Dele Alli was the driving force behind MK Dons' successful promotion push last season. Often physically and mentally dominant over League One players, Alli couldn't have been expected to be so influential after jumping two divisions to play at White Hart Lane. Watching his effortless adaptation to a vastly superior league has been remarkable. He has more than justified the bargain fee of £5 million Spurs spent to bring him in from Milton Keynes. Alli has been one of Tottenham's most consistent players so far. Since winning a place in the starting lineup, Alli has been primarily deployed in a two-man midfield. This is a demanding role for the youngster as it requires him to contribute in both attacking and defensive phases of play. He has quickly developed a knack for energetically dispossessing opponents and quickly turning defence into attack. Eric Dier's rugged presence in Tottenham's midfield has been something of a security blanket for Alli. With Dier's burgeoning qualities as a strictly defensive presence, Alli is freed somewhat. He has also been used in the attacking line behind the main striker where his ability to go beyond the front man has helped create space for Spurs and confusion for their opposition. In both roles, Alli's constant involvement is his greatest contribution. Lacking the passing range to create space with the ball, it is his movement that makes him such a valuable teammate. Constantly seeking space and demanding the attention of multiple defenders, Alli is a nightmare to defend against. He’s nominative position is in central midfield, but he shows remarkable flair for a player comfortable in deep positions. Alli was a 16-goal player last season and will be desperate to add that final product. The poise that he consistently shows in dangerous areas is guaranteed to facilitate plenty of goals in what the fans will hope is a long Spurs career. At this point, his progress will be stilted, but the quality he has already shown in the first months of this campaign will ensure he continues to get his chances. 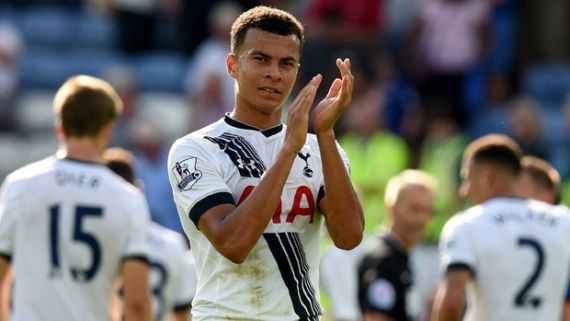 With a packed fixture list, Alli is certain to enjoy a busy first season in the top flight. There is little precedent for a player as young as Alli making a consistent impression in the brutal dogfight that is a Premier League midfield. His potential is as remarkable as the fact that Spurs were able to sign him for so little. With the world's biggest clubs now alerted to his seemingly boundless potential, Tottenham may yet face a battle to retain him. Alli’s confidence with the ball at his feet, and the skill he possesses to back it up, make him a devastating force in one-on-one situations. He is an excellent player, but it is his ability to contribute strongly in both attacking and defending that makes him such a vital player. Already, he is integral to the way Tottenham play. The teenager's potential ceiling is remarkably high. He's quick, strong and skillful while possessing a sharp footballing mind and an engine that would put many defensive midfielders to shame. As if designed for Premier League football, Alli has adapted rapidly and is quickly becoming one of Pochettino's most important players. Alli makes the players around him better. Spurs' backline is performing at a consistently high level in part because of how well the teenager is playing in midfield. With a return to the Champions League firmly back on the agenda at White Hart Lane, Alli's star is rising at the perfect time. England's European Championship campaign in 2016 will provide another opportunity for him to excel under the brightest lights. Alli opened his England goalscoring account against France at Wembley and it was an absolute screamer. The former MK Dons youngster let loose with a sensational strike from outside the area and Twitter predictably went nuts. And it’s this kind of form that will keep him in the national team set up. When Alli shone for MK Dons, it was reasonable to temper expectations. As well as he played in the 4-0 League Cup win over Manchester United two seasons ago, he had not yet been regularly tested against seasoned internationals. That is no longer the case. Of course, Alli is still just 19. Of course, he has not yet played a full season in the Premier League. However, as Alli easily clears every hurdle laid out by his critics, it is becoming more and more difficult to doubt that Tottenham have a budding superstar in their midfield.